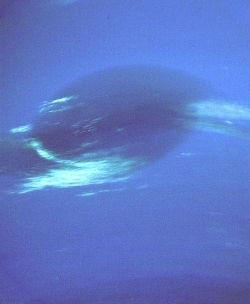 Image: Neptune’s Great Dark Spot, a large anticyclonic storm similar to Jupiter’s Great Red Spot, observed by NASA’s Voyager 2 spacecraft in 1989. The image was shuttered 45 hours before closest approach at a distance of 2.8 million kilometers. The smallest structures that can be seen are of an order of 50 kilometers. The image shows feathery white clouds that overlie the boundary of the dark and light blue regions. Credit: NASA/JPL. Image: This series of Hubble Space Telescope images taken over 2 years tracks the demise of a giant dark vortex on the planet Neptune. The oval-shaped spot has shrunk from 5,000 kilometers across its long axis to 3,700 kilometers across, over the Hubble observation period. Immense dark storms on Neptune were first discovered in the late 1980s by the Voyager 2 spacecraft. Since then only Hubble has tracked these elusive features. Hubble found two dark storms that appeared in the mid-1990s and then vanished. This latest storm was first seen in 2015. The first images of the dark vortex are from the Outer Planet Atmospheres Legacy (OPAL) program, a long-term Hubble project that annually captures global maps of our solar system’s four outer planets. Credit: NASA, ESA, and M.H. Wong and A.I. Hsu (UC Berkeley). The differences between Neptune’s storms and famous Jovian features like the Great Red Spot are interesting though not yet fully understood. The Great Red Spot has been a well described feature on Jupiter for more than two centuries, still robust though varying in size and color. A storm that once encompassed four Earth diameters had shrunk to twice Earth’s diameter in the Voyager 2 flyby of 1979, and has now dropped to perhaps 1.3. As to its heat sources, they are still under investigation, as we saw in 2016 (check Jupiter’s Great Red Spot as Heat Source). But the storm drifted not toward the equator but the south pole, not constrained by the powerful alternating wind jets found on Jupiter. Moreover, we have no information on how these storms form or how fast they rotate. And as the new paper notes, the five Neptune dark spots we’ve thus far found have differed broadly in terms of size, shape, oscillatory behavior and companion cloud distribution. We have much to learn about their formation, behavior and dissipation. When you think about flyby missions like Voyager 2 at Neptune, the value of getting that first look at a hitherto unknown object is obvious. But we are moving into an era when longer-term observations become paramount. The OPAL program with Hubble is an example of this, studying in the case of Neptune a phenomenon that seems to exist on a timescale that suits an annual series of observations. Hubble has been complemented by observations from other observatories, including not just Spitzer but, interestingly, Kepler K2. A robotic adaptive optics system tuned for planetary atmospheric science is being prepared for deployment in Hawaii, offering a way to scrutinize these worlds over even smaller periods. Clearly, there is much room in the discovery space of solar system time domain science. There is room in this discovery space for exploration by a dedicated solar system space telescope, a network of ground facilities, and cadence programs at astrophysical observatories with advanced capabilities. The paper is Wong et al., “A New Dark Vortex on Neptune,” Astronomical Journal Vol. 155, No. 3 (15 February 2018). Abstract. The heat source in Jupiter is hotter due to a larger size, greater mass, inner pressure and larger gravity with more compression. Maybe that’s why the Jupiter red eye storm lasts longer modeling of course on a hurricane like type vortex which transports or funnels heat through the eye into the upper atmosphere? But how much longer will the Great Red Spot last? The sun will be at its minimum in 2019 for activitly, could this cause the fading of these spots. It seems that the earth has a very obvious relationship from the effects of the 11 year sunspot cycle and the 22 solar magnetic pole flip. Energetic particles from solar flares are being sucked into the earth via our magnetic field and it effects weather and thunderstorms. These geomagnetic storms could even cause greater chaos on planets such as Jupiter and Neptune because of the much larger magnetic field that exist on them. There may be a direct connection between the number of hurricanes/typhoons and solar activity. Vorticity is the main cause for severe storms on earth and vorticity is what we see in the storms on these planets. Solar flares and the magnetic and charged particles associate with them may increase the vorticity component in a planet’s magnetic field and increase storms intensity via charge particles. Evidence linking solar variability with US hurricanes. Solar Activity Could Cause Lightning Storms On Earth. Magnetic Storms Affect Humans As Well As Telecommunications. Correlation between Solar Activity and the Brightness of Jupiter’s Great Red Spot. After thinking about this; what if the DNA’s double helix structure is caused by the magnetic field of earth. Could it be that only planets that have a large magnetic field can develop the double helix that is required for life? Do you know if anyone else has considered this idea? If it were true, then why aren’t more things on Earth shaped like helixes? It makes sense – what was one of the main energy sources that existed when life began? The Sun solar flares interacted with the earth’s magnetic field and created geomagnetic storms. Remember that power lines, telephone lines and the telegraph lines created current from these storms to give shocks and blow out circuits and charged the atmosphere. How else are you going to bring Frankenstein back to life! Biological Effects of Magnetic Fields. It is caused by chemistry (or rather the physics of interactions). If magnetic fields could influence DNA helices, then the far stronger magnetic fields from electric motors would have obvious consequences to DNA’s function. That is most certainly not seen. NASA: Solar Storms May Have Been Key to Life on Earth. “Our sun’s adolescence was stormy—and new evidence shows that these tempests may have been just the key to seeding life as we know it. Scientists are able to piece together the history of the sun by searching for similar stars in our galaxy. By placing these sun-like stars in order according to their age, the stars appear as a functional timeline of how our own sun evolved. It is from this kind of data that scientists know the sun was fainter 4 billion years ago. Such studies also show that young stars frequently produce powerful flares – giant bursts of light and radiation — similar to the flares we see on our own sun today. Such flares are often accompanied by huge clouds of solar material, called coronal mass ejections, or CMEs, which erupt out into space. NASA’s Kepler mission found stars that resemble our sun about a few million years after its birth. The Kepler data showed many examples of what are called “superflares” – enormous explosions so rare today that we only experience them once every 100 years or so. Yet the Kepler data also show these youngsters producing as many as ten superflares a day. While our sun still produces flares and CMEs, they are not so frequent or intense. What’s more, Earth today has a strong magnetic field that helps keep the bulk of the energy from such space weather from reaching Earth. Space weather can, however, significantly disturb a magnetic bubble around our planet, the magnetosphere, a phenomenon referred to as geomagnetic storms that can affect radio communications and our satellites in space. It also creates auroras – most often in a narrow region near the poles where Earth’s magnetic fields bow down to touch the planet. The X Factor: Solar storms and life as we know it. “The tail of the magnetosphere, which stretches for hundreds of thousands of kilometers in the direction opposite to the Sun, accumulates magnetic energy. From time to time, it is released in explosions, which heat up plasma, and create powerful electric currents (millions of amperes). When such bursts follow one another, the magnetosphere is filled to capacity with hot plasma, while its electric currents embrace the entire near-Earth space. These phenomena are referred to as magnetic storms. The low and extremely low frequency electromagnetic fields and trillion watt electrical currents induced in the Earth’s atmosphere and conductive surface and subsurface structures would most likely cause the twist in the DNA helix. A trillion here a trillion there adds up to a lot of power. extremely fast changing vorticities in the structure of the auroras. I think it was on National Geographic or Discovery Channel but can not find anything on it, any ideas? MRI scanners aren’t called ‘Suicide Booths’ for a reason. Why MRI scans CAN make you dizzy: Magnetic fields disrupt fluid in inner ear. Apparently the James Webb Space Telescope (JWST) should be able to do just this. Thankfully it is already pretty much ready to go for next year. If only we had orbiter missions for the ice giants! Contact Elon Musk, maybe Jeff Besos, and Yuri Milner if you want to see such missions in our lifetimes. The solar activity which causes storms is of course based on temperature differences. Hot air expands, the molecules move farther apart, so it becomes lighter and expands and creates a partial vacuum. High pressure always flows to low pressure which is the cause of winds which move to fill in the lower pressure or partial vacuum. The sunlight is much less on Jupiter than on Earth and even less on Saturn and the ice giants. They create their own inner heat due to a higher gravitation compression so that has to factor into their meteorology. Why does Saturn have faster winds than Jupiter? Why do the ice giants have even faster winds? It might have something to do with the temperature differences which may be greater the further away from the Sun and internal heating. The air pressure of an atmosphere is also affected by gravity the relative humidity, and chemical composition. Yes, Geoffrey. I was taught that solar insolation actually confounds wind-speed in the giant planets. Less insolation the further out you go leads to faster winds from internal heat, so it seems. MIchael C. Fidler Magnetic fields are space weather, but not clouds and wind or what goes on in the troposphere and stratosphere. Winds are stronger than any effect from the Earth’s magnetic field so temperature changes is what drives them which is basic Meteorology 101. None of your links mention anything about wind, pressure changes and temperature as being controlled by magnetic fields because they are not. I suggest you read your own links more carefully. Sorry if I offended your dogma, but you are wrong: Maunder minimum! Maunder minimum, unexplained period of drastically reduced sunspot activity that occurred between 1645 and 1715. The Maunder minimum coincided with the coldest part of the “Little Ice Age” (c. 1500–1850) in the Northern Hemisphere, when the Thames River in England froze over during winter, Viking settlers abandoned Greenland, and Norwegian farmers demanded that the Danish king recompense them for lands occupied by advancing glaciers. The physical mechanism that explains how a drastic change in solar activity affects Earth’s climate is unknown, and a single episode, however suggestive, does not prove that lower sunspot numbers produce cooling. However, if real, the phenomenon may indicate that the Sun can influence the climate on Earth with even slight fluctuations. Michael C. Fidler – Certified Weather Service Weather observer with FAA FSS from 1982 to 1996 and Weather Service Certified FAA Pilot Weather Briefer from 1982 to 2005. Michael C. Filder. I think there has a been a miscommunication here. This is not my dogma and I don’t wish to be in some kind of some kind of ego competition.. None of these Ideas are mine but are an impersonal system of physical principles that are mind independent and objective which scientists use. If something does not fit into the system of scientific principles which are invariant and universal that is when scientists will say it is not physically objective. I don’t disagree with any of your posts. However there is a difference between space weather and meteorology which you have not acknowledged. I am not arguing that space weather does not affect Earthly meteorology which is a general view but only that the Earth’s magnetic field is too weak to interfere with wind strength and direction. When I say wind I don’t mean solar wind but air which is composed of 78 percent nitrogen, 21 percent oxygen, and trace gases. This is scientific fact which every scientists knows. This is not my idea but I have to agree with it. If you don’t agree with that I don’t have a problem with that. It’s also o.k. with me if you don’t agree with any of my posts. The Earths magnetosphere blocks the solar wind from the Sun which is made of protons and electrons but that is the only wind. Yes, a miscommunication, solar flares and CME do effect WX on earth. The magnetic reconnect that takes place on the Earth’s geomagnetic tail causes huge amounts of energy to be released into the areas that the Aurora come in contact with earth. See articles above on life and solar storms. Space Weather Affecting Climate On Earth – Magnetic Reconnections And Plasma Outflows. Fascinating YouTube video on magnetic reconnections causing low pressure areas to form in earth’s lower atmosphere. What is it going to take to get humanity’s next planetary orbiter missions around Uranus and Neptune? Do we have to look to our billionaire space explorers again? I am not saying this in a bad way at all, just a bit disappointed in certain government-funded space agencies these days.